50 x WARNING MORE THAN ONE SUPPLY electrical safety warning labels, produced on Semi Gloss paper material. 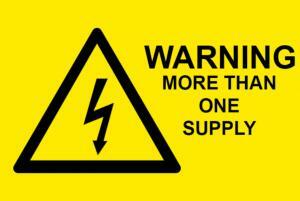 These Labels are designed for use as warnings on electrical panels, cabinets, equipment and instruction panels. Our range of electrical labels have internationally recognised electrical symbols, and clearly identify risks to employees and maintenance engineers of the dangers of injury from electricity. The labels are ideal for many medium-life indoor applications.